New Partnership ! TECHNOMARK North America and BAND-IT ! Discover the new partnership between BAND-IT and Technomark North America for laser marking solution. BAND-IT are experts and the leaders in high-quality enginereed band clamping and fastening solutions. Thanks to a partnership with Technomark North America, BAND-IT is now able to provide a laser marking solution for permanent identification of BAND-IT metal ID bands in a high-volume production environment. 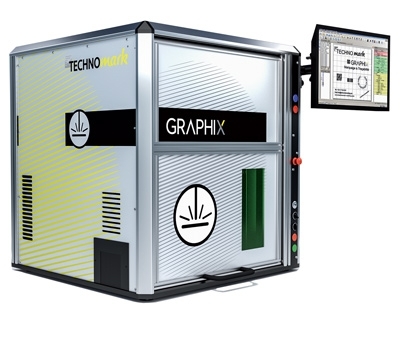 The Graphix Laser integrates the laser source, the optic, the focal and the control electronic system.